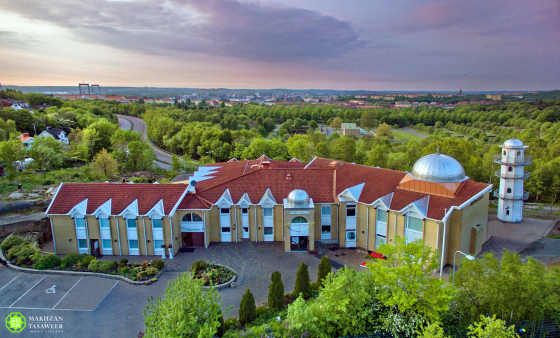 On 20 May 2016, the World Head of the Ahmadiyya Muslim Community, the Fifth Khalifa (Caliph), His Holiness, Hazrat Mirza Masroor Ahmad delivered his weekly Friday Sermon from the Nasir Mosque in Gothenburg, Sweden. During his address, His Holiness said that much of the world was moving away from God Almighty in favour of materialism and immorality. For example, His Holiness cited chapter 4, verse 94 of the Holy Quran, which outlaws murder in the strongest possible terms. His Holiness said that many Muslims were ignoring this commandment and instead mercilessly targeting one another in the various conflicts that have plagued the Muslim world. His Holiness also addressed and explained the issue of Hijab. He said that Hijab was a form of modesty taught by the Holy Quran and that there were many young Ahmadi Muslim women who took great pride in wearing headscarves and did not care if they were mocked or ridiculed. His Holiness said that such women considered observing Hijab as their personal choice, freedom and right. During his address, His Holiness spoke of both the positive and negative effects of television and the Internet. For example, he said that both could be used as a means of promoting morality, education and learning. However increasingly, people were engaged in watching indecent or immoral programmes leading to the breakdown of homes and unrest within families. The Khalifa went on to illustrate the positive alternative offered by the satellite channel of the Ahmadiyya Muslim Community, MTA International. He advised Ahmadi Muslims to watch the weekly Friday Sermon delivered by the Head of the Ahmadiyya Muslim Community as a family, as well as other broadcasts. His Holiness also counselled Ahmadi Muslims to bring their children to their local Mosques and to involve them in the activities of the Ahmadiyya Muslim Community. 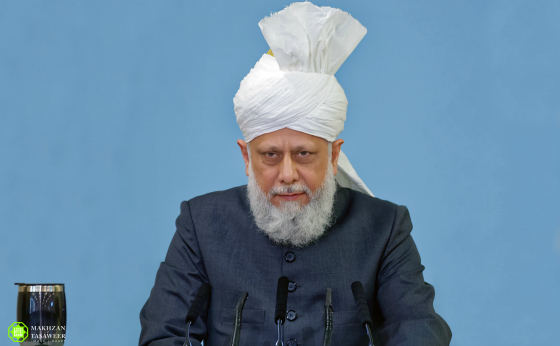 His Holiness said that Ahmadi Muslim elders should draw younger members towards religion through love and compassion, rather than drive them away with needlessly harsh attitudes. Share the post "Head of Ahmadiyya Muslim Community says true teachings of Quran being ignored in Muslim World"